St. Steven's Day: Die Lunæ, 26 die Decembris. Message to the H. C. for a Conference about the Earl of Leicester and the Inland Post-office. 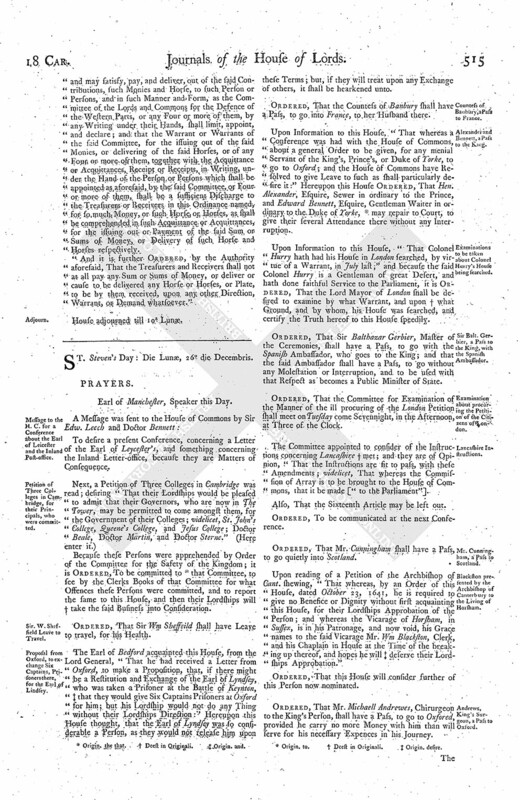 Petition of Three Colleges in Cambridge, for their Principals, who were committed. Sir. W. Sheffield Leave to Travel. Proposal from Oxford, to exchange Six Captains, Prisonersthere, for the Earl of Lindsey. Countess of Banbury, a Pass to France. Alexander and Bennett, a Pass to the King. Examinations to be taken about Colonel Hurry's House being searched. Sir Balt. Gerbier, a Pass to the King, with the Spanish Ambassador. Examination about procuring the Petition of the Citizens of London. Mr. Cunningham, a Pass to Scotland. Blackston presented by the Archbishop of Canterbury to the Living of Horsham. Andrews, King's Surgeon, a Pass to Oxford. Sir John Curzon and Mr. Hone, to be released upon Bail. Message from the H. C. for Concurrence in the Two following Orders. Order for the safe Conveyance of Packets to and from Scotland. Sposford presented by the House to the Vicarage of Silkeston. Petition of Three Colleges in Cambridge, for their Principals to be released, who are in The Tower. Earl of Manchester, Speaker this Day. To desire a present Conference, concerning a Letter of the Earl of Leycester's, and something concerning the Inland Letter-office, because they are Matters of Consequence. Because these Persons were apprehended by Order of the Committee for the Safety of the Kingdom; it is Ordered, To be committed to (fn. 1) that Committee, to see by the Clerks Books of that Committee for what Offences these Persons were committed, and to report the same to this House, and then their Lordships will (fn. 2) take the said Business into Consideration. Ordered, That Sir Wm Sheffeild shall have Leave to travel, for his Health. The Earl of Bedford acquainted this House, from the Lord General, "That he had received a Letter from Oxford, to make a Proposition, that, if there might be a Restitution and Exchange of the Earl of Lyndsey, who was taken a Prisoner at the Battle of Keynton, (fn. 3) that they would give Six Captains Prisoners at Oxford for him; but his Lordship would not do any Thing without their Lordships Direction:" Hereupon this House thought, that the Earl of Lyndsey was so considerable a Person, as they would not release him upon these Terms; but, if they will treat upon any Exchange of others, it shall be hearkened unto. Ordered, That the Countess of Banbury shall have a Pass, to go into France, to her Husband there. Upon Information to this House, "That whereas a Conference was had with the House of Commons, about a general Order to be given, for any menial Servant of the King's, Prince's, or Duke of Yorke, to go to Oxford; and the House of Commons have Resolved to give Leave to such as shall particularly desire it:" Hereupon this House Ordered, That Hen. Alexander, Esquire, Sewer in ordinary to the Prince, and Edward Bennett, Esquire, Gentleman Waiter in ordinary to the Duke of Yorke, (fn. 4) may repair to Court, to give their several Attendance there without any Interruption. Upon Information to this House, "That Colonel Hurry hath had his House in London searched, by virtue of a Warrant, in July last;" and because the said Colonel Hurry is a Gentleman of great Desert, and hath done faithful Service to the Parliament, it is Ordered, That the Lord Mayor of London shall be desired to examine by what Warrant, and upon (fn. 5) what Ground, and by whom, his House was searched, and certify the Truth hereof to this House speedily. Ordered, That Sir Balthazar Gerbier, Master of the Ceremonies, shall have a Pass, to go with the Spanish Ambassador, who goes to the King; and that the said Ambassador shall have a Pass, to go without any Molestation or Interruption, and to be used with that Respect as becomes a Public Minister of State. Ordered, That the Committee for Examination of the Manner of the ill procuring of the London Petition shall meet on Tuesday come Sevennight, in the Afternoon, at Three of the Clock. The Committee appointed to consider of the Instructions concerning Lancashire (fn. 5) met; and they are of Opinion, "That the Instructions are fit to pass, with these Amendments; videlicet, That whereas the Commission of Array is to be brought to the House of Commons, that it be made ["to the Parliament"]. Also, That the Sixteenth Article may be left out. Ordered, To be communicated at the next Conference. Ordered, That Mr. Cunningham shall have a Pass, to go quietly into Scotland. Upon reading of a Petition of the Archbishop of Cant. shewing, "That whereas, by an Order of this House, dated October 23, 1641, he is required to give no Benefice or Dignity without first acquainting this House, for their Lordships Approbation of the Person; and whereas the Vicarage of Horsham, in Sussex, is in his Patronage, and now void, his Grace names to the said Vicarage Mr. Wm Blackston, Clerk, and his Chaplain in House at the Time of the breaking up thereof, and hopes he will (fn. 6) deserve their Lordships Approbation." Ordered, That this House will consider further of this Person now nominated. Ordered, That Mr. Michaell Andrewes, Chirurgeon to the King's Person, shall have a Pass, to go to Oxford, provided he carry no more Money with him than will serve for his necessary Expences in his Journey. That they have delivered their Message to the House of Commons; and they being now in Debate of Business concerning the Safety of the Kingdom, they will return an Answer by Messengers of their own. Ordered, That Sir Jo. Curzon and Mr. Hone, Prisoners in The Tower, shall be released from their Imprisonment in The Tower, (fn. 7) giving Security not to depart from the City of London and Westm. without Leave of this House, and to appear at such Time as they shall be Ordered before the Lords in Parliament. "It is this Day Ordered, by the Lords and Commons, That all Packets and Bearers coming from His Majesty, or any of His Secretaries of State, to the Council, Chancellor, or Secretary of Scotland, or to the Scottish Commissioners resident here, and from any of them, back to His Majesty, or His Secretary of State; as also all Packets and Bearers from the Council, Chancellor, or Secretary of Scotland, to the Scottish Commissioners, and from the Earl of Lindsey, or any other Nobleman Commissioner coming from that Kingdom, back again to the Council, Chancellor, or Secretary of Scotland, may pass without Search or Stay; and that all Post-masters be commanded readily to furnish Horses for all such Packets, as they will answer at their Perils." 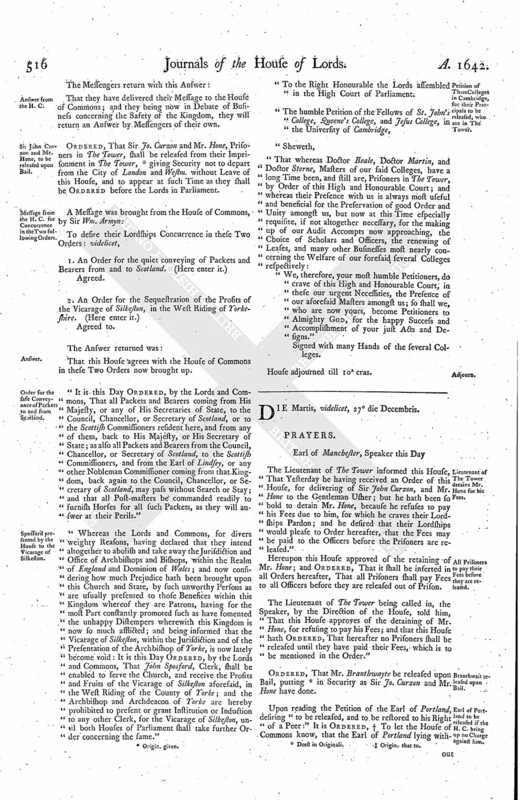 "Whereas the Lords and Commons, for divers weighty Reasons, having declared that they intend altogether to abolish and take away the Jurisdiction and Office of Archbishops and Bishops, within the Realm of England and Dominion of Wales; and now considering how much Prejudice hath been brought upon this Church and State, by such unworthy Persons as are usually presented to those Benefices within this Kingdom whereof they are Patrons, having for the most Part constantly promoted such as have fomented the unhappy Distempers wherewith this Kingdom is now so much afflicted; and being informed that the Vicarage of Silkeston, within the Jurisdiction and of the Presentation of the Archbishop of Yorke, is now lately become void: It is this Day Ordered, by the Lords and Commons, That John Sposford, Clerk, shall be enabled to serve the Church, and receive the Profits and Fruits of the Vicarage of Silkeston aforesaid, in the West Riding of the County of Yorke; and the Archbishop and Archdeacon of Yorke are hereby prohibited to present or grant Institution or Induction to any other Clerk, for the Vicarage of Silkeston, until both Houses of Parliament shall take further Order concerning the same." "To the Right Honourable the Lords assembled in the High Court of Parliament. "We, therefore, your most humble Petitioners, do crave of this High and Honourable Court, in these our urgent Necessities, the Presence of our aforesaid Masters amongst us; so shall we, who are now yours, become Petitioners to Almighty God, for the happy Success and Accomplishment of your just Acts and Designs." Signed with many Hands of the several Colleges.